George C. Sammeth, Jr. was born in Baltimore, Maryland in 1952. An educator for five years, he became an air traffic controller for the F.A.A. in 1983. He began collecting in 1976, but did not discover ALPCA until 1983. He served as Vice President from 1998-2000. In his campaign statement, he said "I collect license plates. For me, this includes buying, selling, trading, reconditioning, preserving, and displaying them. I am a student of their history, and a research writer of information concerning vehicle registration." He co-authored along with Tom Boyd the award winning book COLORADO LICENSE PLATES: Facts, Figures and Folklore in 1991. Previously he wrote a small booklet Colorado License Plates, a brief history in the mid 1980s. He has been the editor of The Mountain Outline since December 1988. George wrote the feature piece "Colorful Colorado" for the June 1993 ALPCA newsletter. It has been said that the best way to know someone is to ask his friends. 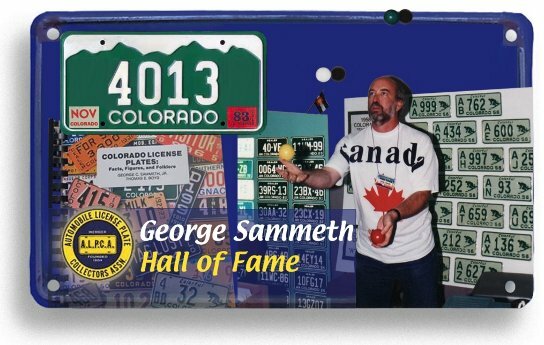 George Sammeth, welcome to the ALPCA Hall of Fame.